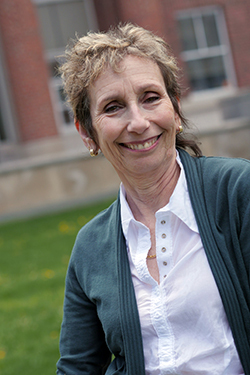 Deborah Pellow, professor and undergraduate director in the Department of Anthropology, has been named Faculty Advisor of the Year for the College of Arts and Sciences and the Maxwell School of Citizenship and Public Affairs. Burdick notes that Pellow knows the names of all the nearly 90 majors in the department. And in addition to getting to know them beyond what is strictly required, she does things like invite those who can’t make it home to her house for Thanksgiving dinner. Fun is how Pellow classifies a lot of what she does for advisees. “I care about my field, and it’s a lot of fun being able to talk it up,” she says. “Students have that great energy, and that’s great to be around.” She adds that she’s always willing to go out of her way if the student is willing to follow suit. Jose Esteban Rodriguez III talks about Pellow’s willingness to participate in a program in the Brewster-Boland-Brockway complex to encourage first-year students to interact more with faculty members. She dined with residents at Brockway and even visited residents in their dorm rooms. “Residents see Professor Pellow as a fun, engaging and knowledgeable individual,” Rodriguez says.